There are a number of good wine sales on right now. One of the best must be at O’Briens. Why? Because they have reduced quite a few well known brands at their current vintages by cash amounts. No messing with hard to decipher % amounts here! A quick glance at the photo attracts me to the Campo Reserva at only €9.95 but especially to the brilliant Antinori Peppoli Chianti Classico. Chianti Classico’s right now are drinking beeeeautifully! But you Must spend a few bob see how good they can be … now’s our chance. The O’Briens Sale is on for another week. It is worth reading through their web site and then visiting one of their stores. Ask questions. See what’s open to taste. 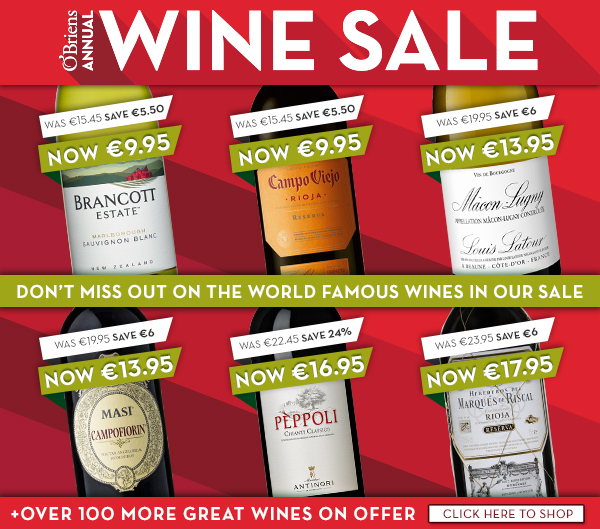 A Wine Sale is a lot more than allowing O’Briens to just sell wine. It’s also about us all getting involved. Well, it should be – shouldn’t it? Tons of wines. What to choose? Sometimes we all want to see what the fuss is about the latest craze in grapes but can’t quite afford to check them out. Albariño from Galicia has grown in this regard from a few years ago when virtually no one had heard of it at all. What’s the fuss? Extreme minerality on the finish to a searingly rich ripeness in the middle of the palate. Superb value at €10.95. Watch out for more write ups on grapes and style close to Galicia in the near future. I am such a complete Antinori fan .. (I could not believe my ears this year when I heard the Findlater’s guys say they won’t miss representing the brand – it moved across to Tindals) .. the Antinori family history is unparalleled, their estates impeccable, and the wines are just superb. Peppoli Chianti Classico is a steal at €16.95. Oak ageing in Slavonian casks show off the Sangiovese grape (with some Merlot and Syrah) to perfection . Classy. Great gift. It’s a Cabernet/Merlot Biodynamic wine of immense proportions. O’Briens have it right when they say: Imagine the complexity and finesse of Bordeaux mixed with the warm, sweet berry charm of the Languedoc and there you have Cigalus. A proper fine wine from one of France’s most awarded winemakers Gérard Bertrand. Posted in Consumer Events, Wine Grapes, Wine Regions, Wine Sales in Ireland, Wine Stores in Ireland and tagged French Wine Sale, OBriens Wine, Wine, Wine Tasting. Bookmark the permalink.